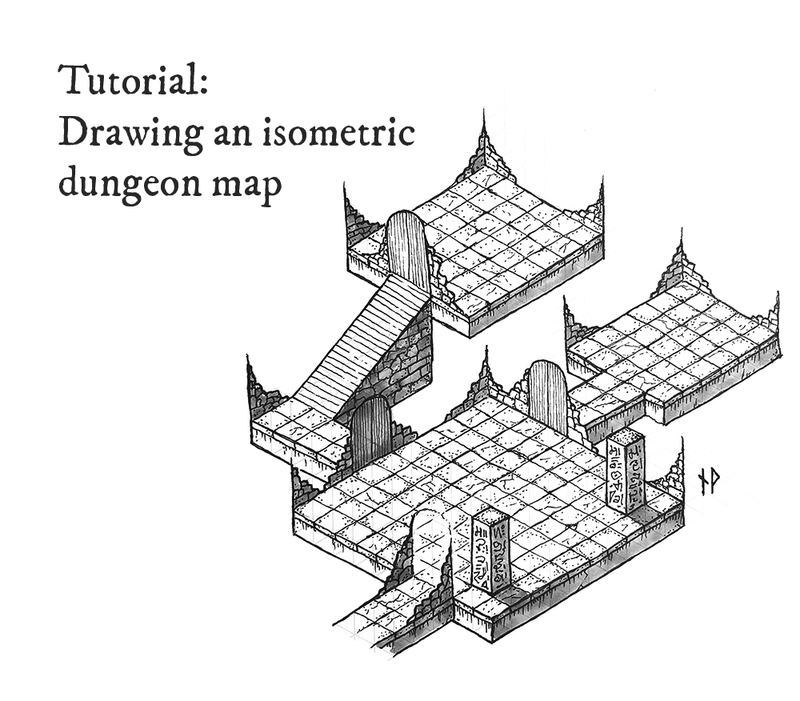 Hi everyone, as a follow-up on my last tutorial, on how to draw basic, top-down dungeon maps, I thought I’d write a guide on how to draw isometric maps. This image will be the end result of this tutorial. 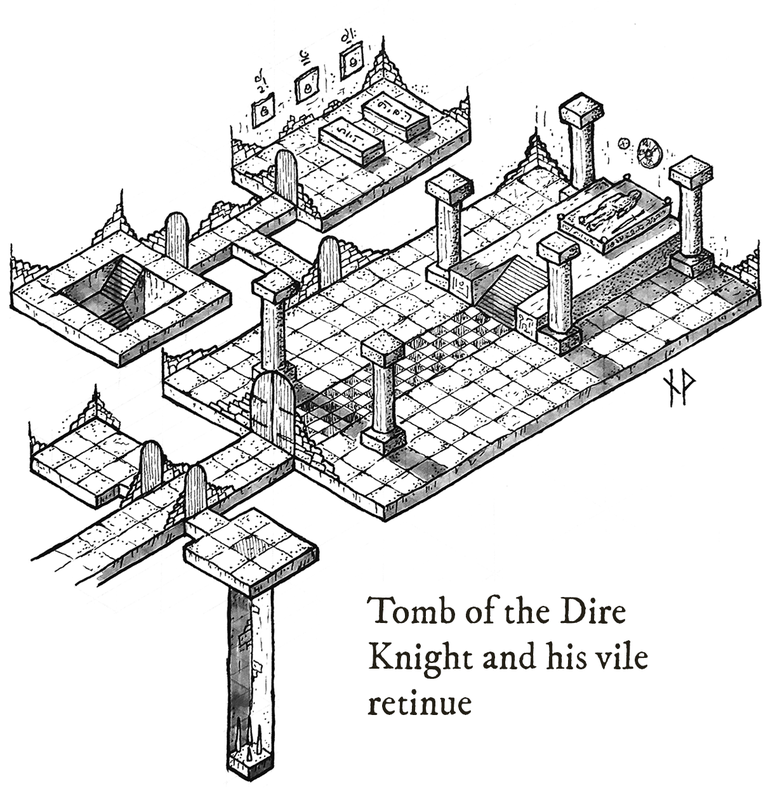 I really like isometric maps; not only do they look good, but are also a great way of describing the difference in height between objects and floor levels, making such maps really useful for the dungeon master. Also, it doesn’t hurt that some of my favourite computer games are all isometric RPG’s (like Diablo, Baldur’s Gate, Pillars of Eternity and Tyranny). For this tutorial, I will be using a set of Micron markers (0.05, 0.1 and 0.2), a mechanical pen and an Ice Grey 4 Promarker. 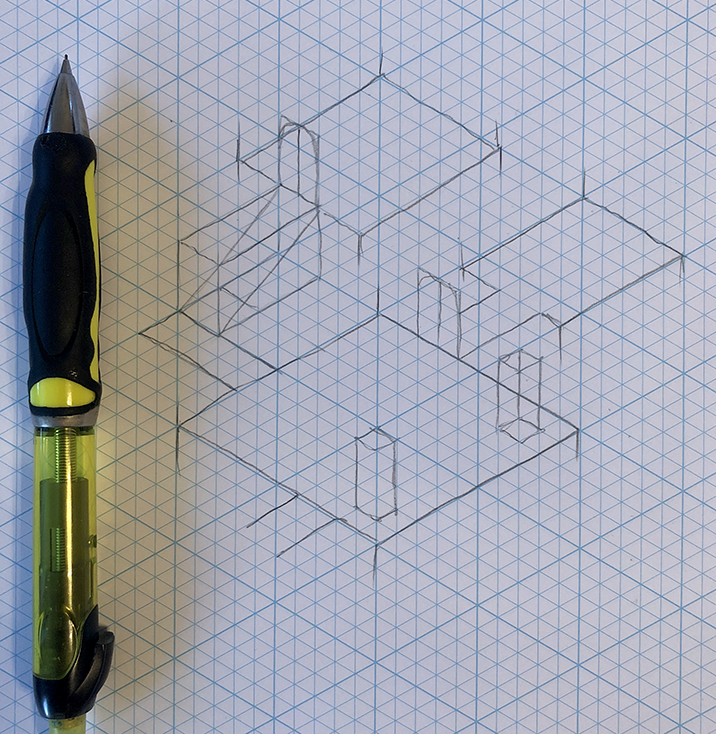 Also, I strongly recommend you to get isometric paper for this kind of map, as it makes the process much easier. 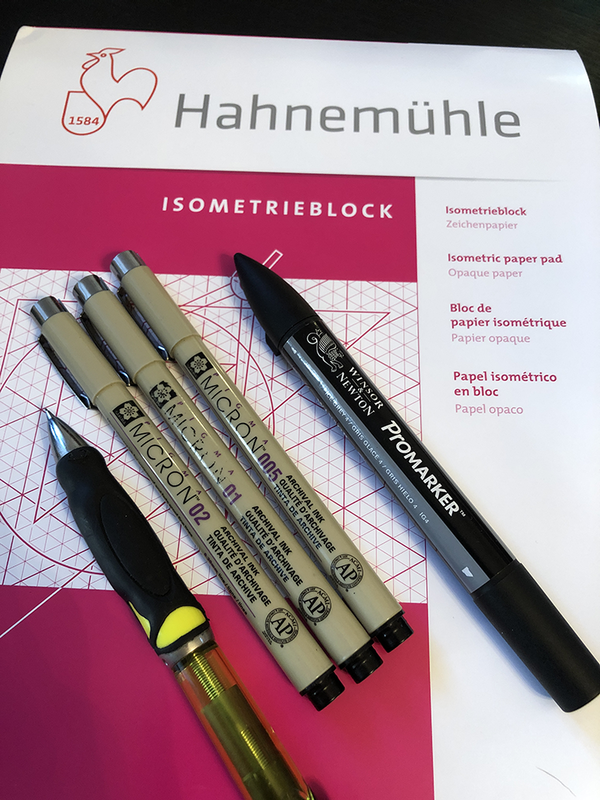 I have a pad made by Hahnemühle. If you live in Sweden, like me, all of this stuff can easily be ordered from https://www.penstore.se/ I really recommend this store (they do not sponsor me in any way). 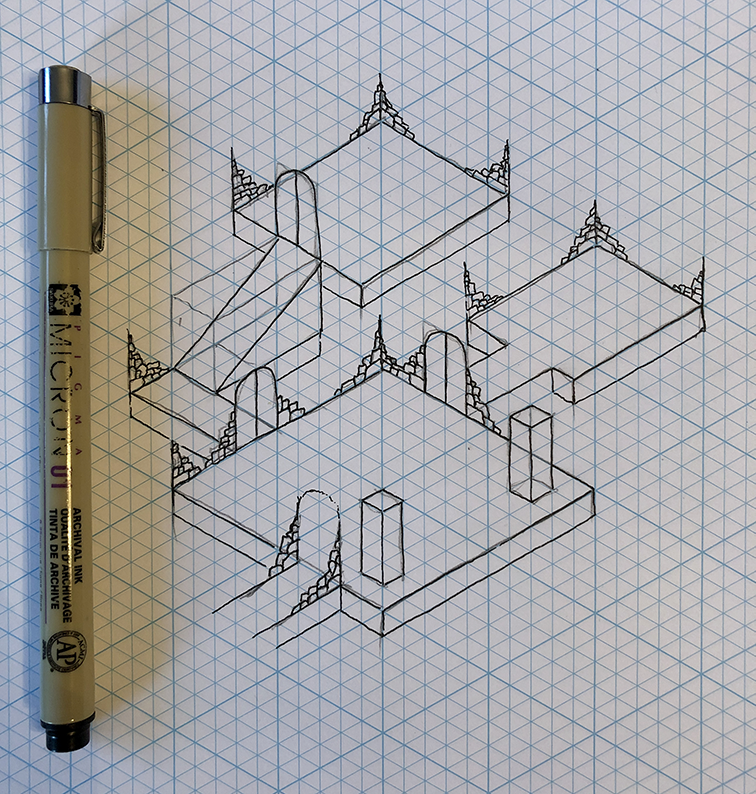 This is the most complex part of the drawing if you’re not used to isometric perspective, so make sure you’re happy with what you got before moving on to the next step. When you are happy with your pencil drawing, go ahead and put down the first ink. I use a 0.1 marker for this step (I will add some weight to them later on). As you can see, I also added parts of stone walls to the corners, as it provides a sense of a confined environment, without obscuring the map too much — we don’t want to cover up important stuff! After erasing the pencil outlines, I go over the inked outlines once more with a thicker marker, in this case a 0.2. 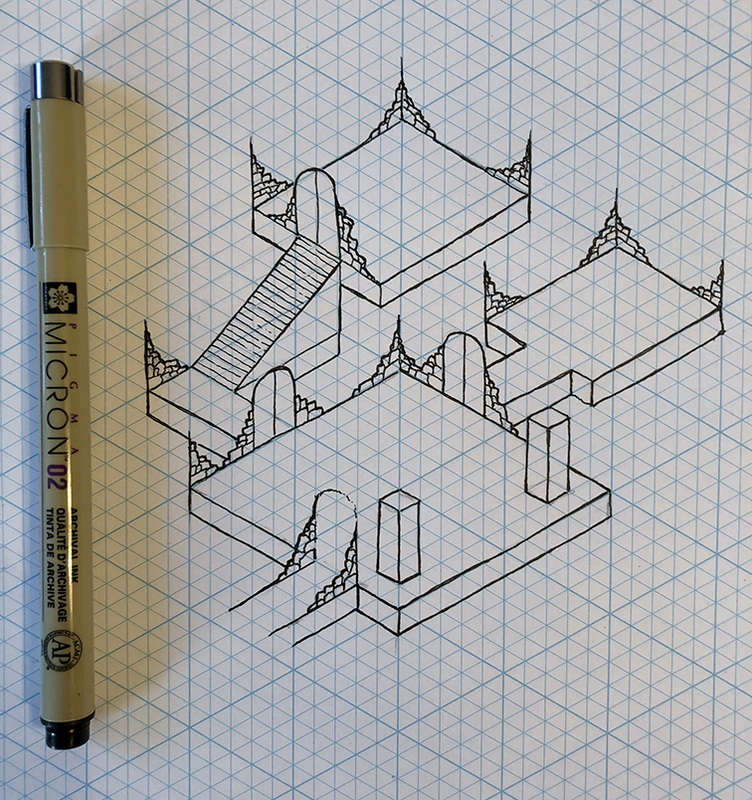 This is done for two reasons: first of all the 0.1 outlines takes a bit of a beating when using the eraser, and second I want to provide a bit of contrast to the texture we’ll be adding to the map in the next few steps. You could go for an even heavier outline, but I settled for 0.2 in this one. In the next step I add flagstones with a 0.1 marker. 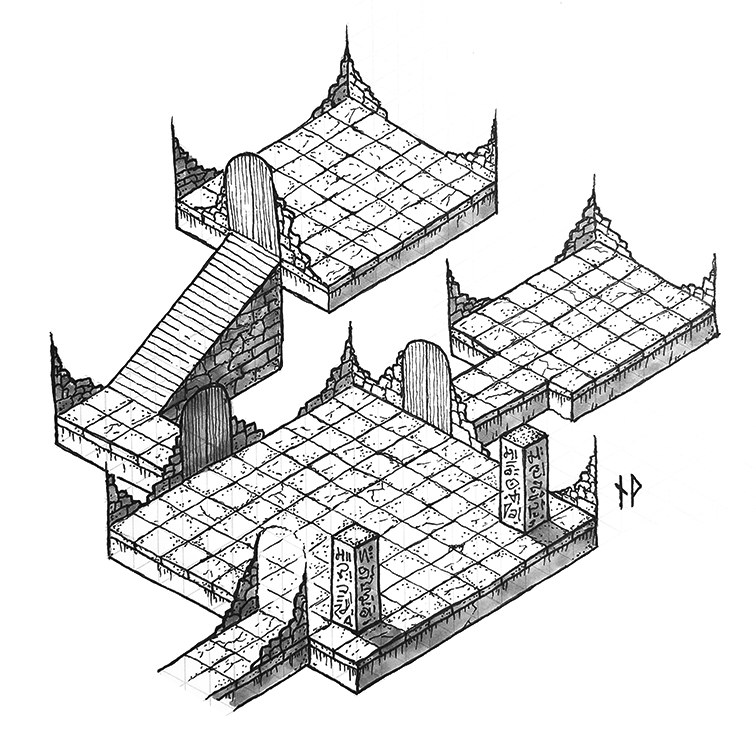 Flagstones are good as they provide a nice surface to add texture to the dungeon, but also helps the dungeon master should he need a grid to draw out the rooms on a battle mat. Note that I added some extra definition to the flagstones, making it look like they are a “layer” on top of the ground. I also added some some wood texture to the doors with a 0.05 marker. 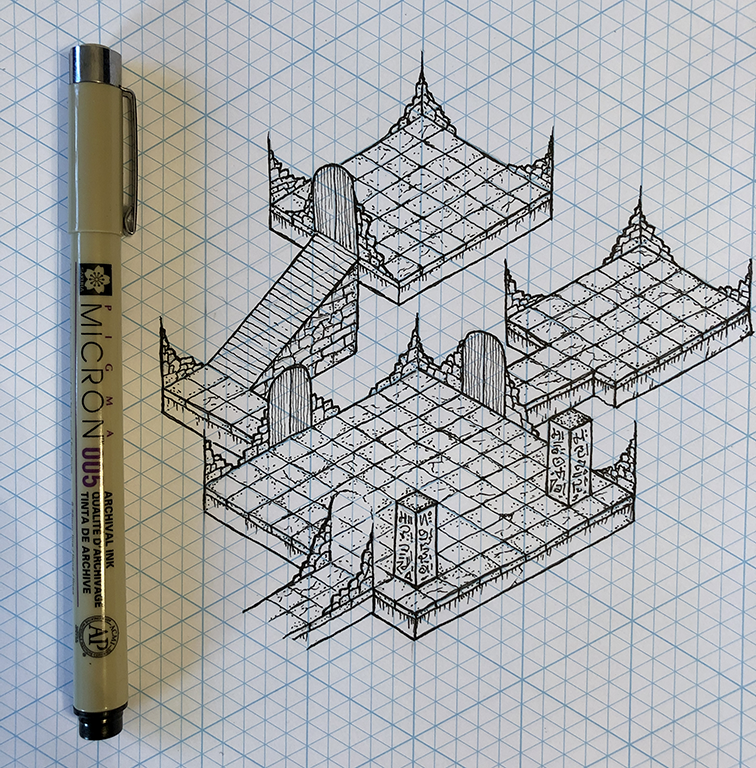 Time to add texture to the dungeon. This is the most time-consuming step, so if you’re drawing a large map, make sure you have a glass of whisky (or whatever your poison is) and some good background music. Use a 0.05 marker to add random dots, scratches and cracks to the flagstones, walls and ground. 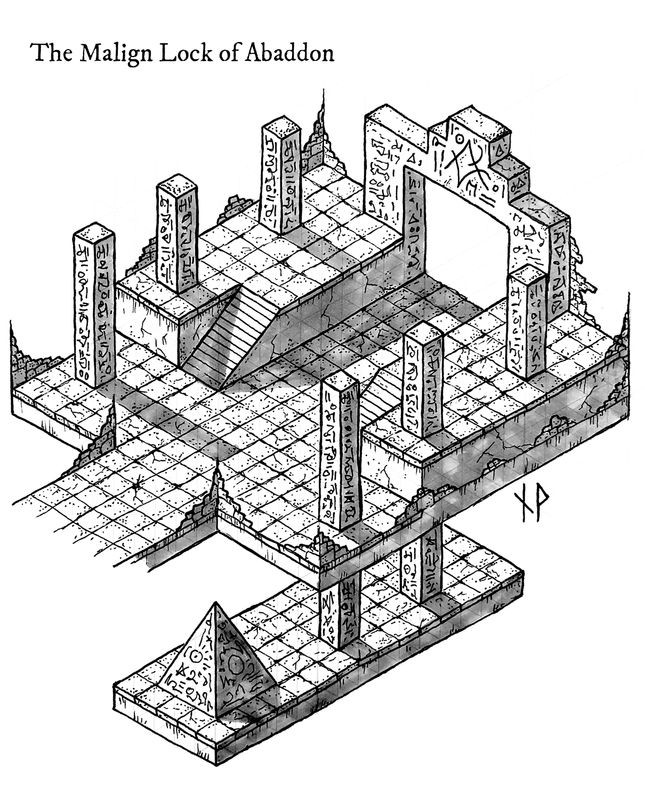 Also, I drew some arcane symbols to the pillars to add a bit of mystery. Perhaps these are puzzles for the adventurers to solve for the doors to open — who knows? Decide which surfaces should have shadows. 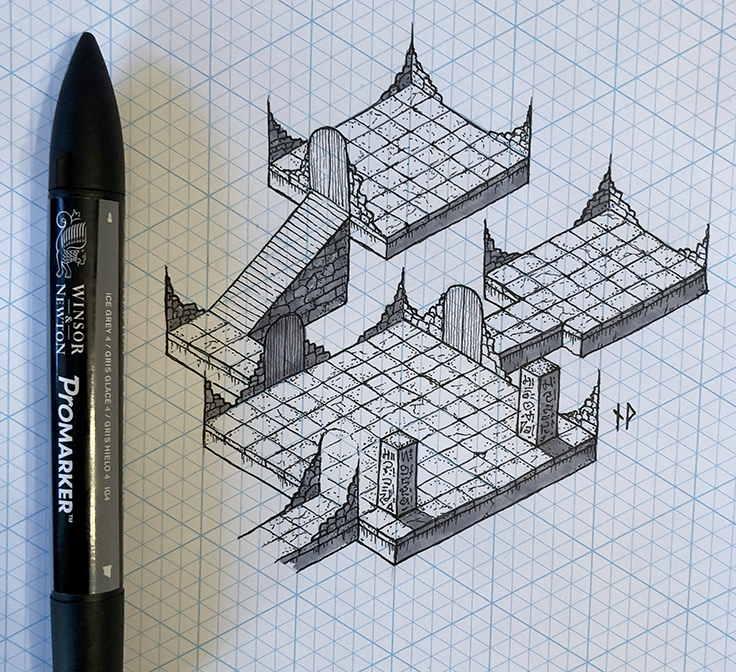 In this case, I decided the surfaces facing south east should be darker, and drew the shadows with a grey Promarker. Adding the shadows makes it easier to read and understand the map as it helps the eye understand how to interpret the perspective. It also adds a bit of contrast, making it look more interesting. I use Photoshop to clean up the map. 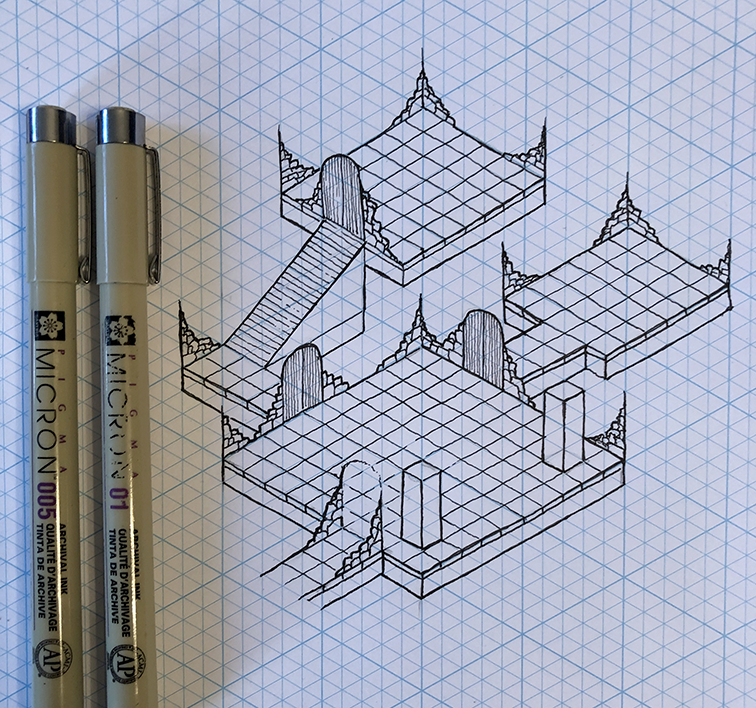 My preferred way to get rid of the grid is by taking the steps in this tutorial. I’m not an expert on image software, so I rely on the knowledge of other people. There! The map is done and ready for play! I post a lot of my work on my website, at https://www.wistedt.net/. 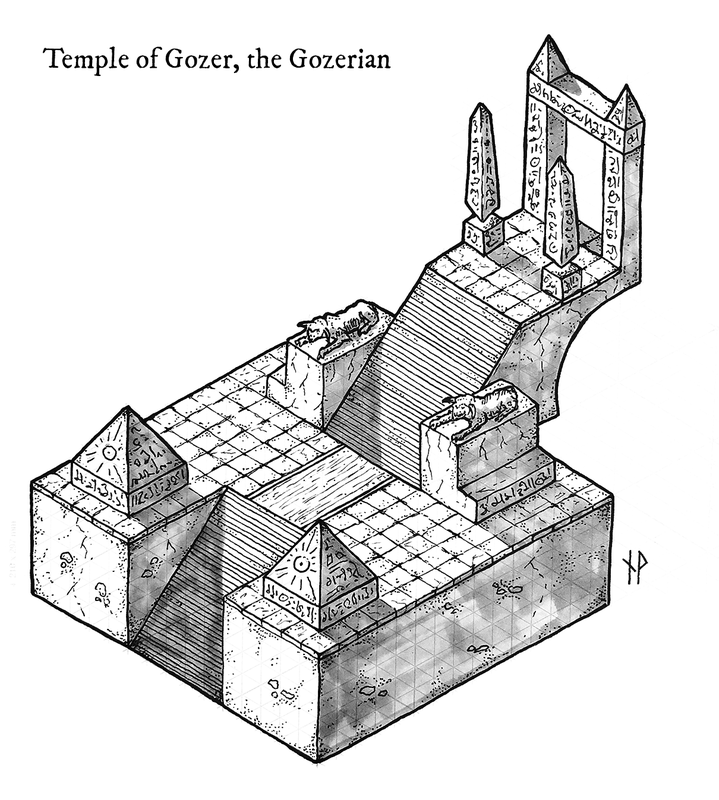 There you can find many maps and other RPG recources that are free to download for personal use.